Sharing images is crucial to what you do with your CCTV. SiraView makes it easy to export single frames as still images (BMP or JPEG) or send them directly to a printer. Exported or printed images can also display camera, time and decoder information. 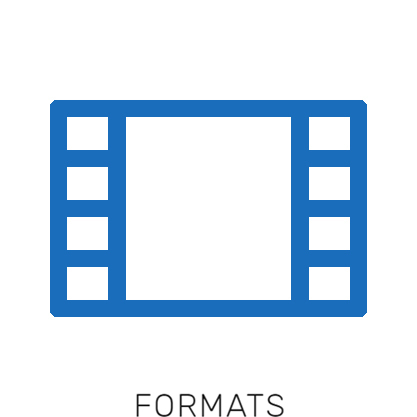 Video sequences can be burnt directly to DVD, or converted and saved to formats including QuickTime, MPEG and H.264. Multiple camera streams can be exported simultaneously. Our bookmark and storyboard features enable efficient labelling and referencing of clips. Using our split-screen viewer, you can navigate through your footage and mark up pertinent events as you go, by adding clips onto your storyboard. Each clip retains its original metadata, ensuring easy and reliable referencing to your source material to guarantee evidential quality. Storyboard clips and data can be organised by date, subject etc., according to your needs, and can be readily recalled. SiraView supports hundreds of CCTV formats, with many more added with every new release. Although SiraView offers cutting-edge metadata reporting, to maximise our scope and increase viewing capability we also incorporate several generic, image-only players. We employ rigorous testing before supporting additional formats to ensure evidential quality. Sira comprehensively references the manufacturers’ information, and conducts analysis of samples to ensure our product runs efficiently with every supported format. SiraView navigation is simple and instinctive, giving you precise control over your CCTV. The dual-slider technology allows you to skip and reverse rapidly to an approximate point in your footage, before fine-tuning or stepping through sequences a frame at a time as you comb for detail. Simple keyboard shortcuts enable you to jump directly to a date or time, saving you the fuss of scrolling through volumes of material. We also offer a limited version of SiraView for customers who wish only to view CCTV images. SiraView Express allows the user to utilise our universal viewer for multiple formats, but without the added functionality of export and conversion, storyboarding, or metadata control and analysis. Contact us for further information or a full feature comparison.